Virgin Mobile plans offer good deals on no-contract smartphones and good unlimited plans as long as you're within the coverage area provided by Sprint. Virgin has ended its iPhone-only experiment. You can now get Android phones (as well as iPhones from the Virgin Mobile USA site. However, they have also ended their offer of getting the first six months of service for $1. Plans start at $35 per month. For years, Virgin would often give vague answers to questions about having iPhones in their line-up. They did eventually re-introduce them, but now they've gone a step further. Virgin just announced that they will only offer iPhones, and, if you sign up quickly you can get six months of unlimited service for $1. They used to offer a line-up that featured a selection of phones from different manufacturers, and you may still be able to purchase these devices and airtime cards in retail stores such as Walmart and Target, but as of June 21, 2017their website only features Apple's iPhones. Companies with the Virgin brand name are generally known for taking a basic service like air travel or train travel (in the UK) and giving you more than you expect. Sometimes you pay a small premium for that extra level of service, but it can be worth it. We tried and liked their plane service to London and train to Birmingham.There is also an element of fun associated with their brand (probably not a bad place to work if you're looking for a job). This was an advantage Virgin had that they had never really taken advantage of with their phone business, but now that's changed. Part of their new plan is that you will sign up for the Inner Circle membership and get offers for using their other services such as discounts on hotels and travel. I know some people put their phones on airplane mode just to save battery while playing video games, but how about using the mode, as intended, when you get on an airplane. As part of the Inner Circle membership you get a 20 percent discount on flights booked directly through Virgin, and you can get your third night free on hotel stays booked in the same manner. Virgin relies on the Sprint network in the U.S. You can now check out street-level coverage here. There are now three Virgin Mobile plans. They all have unlimited calls and text. For $35 per month you get 5GB high-speed data, for $45 you get 10GB, and for $60 you apparently get unlimited high-speed data. On the 5GB and 10GB plans, your speed can drop down to 2G levels after you've used up your allotment. The old plans are probably still available for the devices they used to sell. Until that is clarified, the descriptions will stay here in the archive section below. With the introduction of iPhones to the Virgin Mobile family, came the iPhone plan which cost $50 per month for unlimited service. That included unlimited voice, unlimited texts, and unlimited data. There was also an introductory offer: the first six months of service for $1. This offer was originally for one year, but was modified to six month. This offer finally expired around August 23, 2018. The plans are now as listed above. Now if you asking is it really unlimited, the answer is mostly yes. For talk, you get unlimited voice minutes in Sprint's network and up to 800 minutes when roaming. For your data use on the $60 plan, Virgin doesn't want you to put an "unfair burden" on their service or "disrupt" others use of the service. More specifically, their Quality of Service agreement states that they can "deprioritize" your data once you've used 35GB (which is an upgrade over the earlier limit of 23GB). I'm not sure what "deprioritize" means exactly, whether that means a reduction to 2G speeds as when exceeding the limit with the other plans or something less drastic. After a big introduction, the iPhone was not available from Virgin for a long time. After Apple released the iPhone 6, Virgin Mobile discounted the 5S and previous models. Then they were gone! Other sites speculated about what happened, but the only official response was something along the lines that they have a great selection of Android phones. Eventually the iPhone was added back to the lineup where it co-existed with the other phones, until the announcement in June 2017 that only iPhones would be available! You have to click through to each model and memory size to find the prices for each, so I've tried to list them all in one place here. Availability varies. Colors: Gold, Gray, Rose Gold, and Silver. As I mentioned at the beginning, Virgin has a reputation for great customer service. I expect that to be same here or at least better than average. However, you can manage your virgin mobile account online by setting up how you want to refill your airtime, either manually or via auto-refill. You can also swap your phone online when you're ready to move on to a new handset. It seems like such a great deal, but are there any drawbacks? Some commentators have mentioned that this move was Virgin Mobile fight for survival in the U.S as Sprint had also entered the prepaid market. From you perspective there is the possibility that if this doesn't work out, that Virgin could exit the market. If that happened, it isn't clear if you could use your phone with any non-Virgin plan. However, my guess is that they will stick around for at least a year to honor the $1 service for the first year commitment. At a normal price of $50 a month, you would save $600 over the first year. If you purchase an iPhone for $600 or less, it is as if you got it for free. At that price point, you can get up to an iPhone 6s. Alternately, you could compare the savings to your current plan or some other (possibly cheaper) unlimited plan and see what your savings are there, though that's not really an apple-to-apples comparison unless you include the cost of the phone under the other plan. The reward is of course a really unlimited and affordable plan for an iPhone. Formerly known as the "Beyond Talk", these plans offer a mixture of limited and unlimited service in one or more of the talk, text and data usage buckets. The $20 plan is a WiFi only plan. You get 300 minutes voice, unlimited texts and NO data. This might work for students who spend most of the time in environments (home, campus, bar etc.) that have WiFi connectivity. If this sounds appealing, you may also wish to investigate Republic Wireless which offers unlimited talk, text, and no data for $10 a month with the twist that you can also make calls over WiFi when available and over cellular when not. For $35 per month you can get unlimited talk, unlimited text and 250 MB high-speed data (with unlimited low-speed data) or you can opt for just 300 minutes voice, unlimited text and 2.5 GB high-speed data. For $45 per month you can unlimited voice plus 100 international minutes, unlimited text plus international text, and 1 GB high-speed data. For $55 per month you get unlimited voice plus 100 minutes international minutes, unlimited text plus international text, and 3 GB high-speed data. Depending on your habits, one of these plans should work for you. You can choose from three PayLo plans that cost $20, $30 and $40 per month. There is also a Basic Rate plan that costs 20 cents per minute with a 90-day service period for refills that is similar to the Tracfone airtime features. The $20 per month plan gives you 400 minutes of voice (5 cents per minute). It was previously called the Talk plan because text messages cost 15 cents extra, and web access costs $1.50 per megabyte. The PayLo $30 a month plan gives you 1500 minutes, 1500 texts and 30 MB of web data. This plan is a good deal and is actually better than the Straight Talk $30 plan. The PayLo $40 per month unlimited plan give you unlimited talk and text but stops short at 50 MB of web access. This plan is a kind of mirror image of the Beyond Talk plans that offer unlimited data but limited voice minutes. 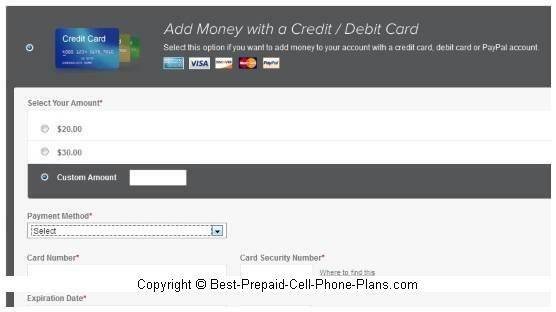 This plan is not advertised on the website, but it is still offered as an option when you activate your phone online. As mentioned above, calls cost 20 cents per minutes. Text messages also cost 20 cents each. These rates are expensive, but on the plus side, if you are an infrequent user, the refills last 90 days instead of 30. You can top up your minutes via online via Paypal, or with your debit or credit card. There is an automatic top up option that adds $20 when your account get to below $5. You can also buy airtime cards, called "top-up" cards in stores like Walmart and Target or online at Amazon.com. Virgin Mobile has offered broadband plans for a couple of years now. The plans themselves are great, however you have to watch out for coverage. The $5 per day plans offers 250 MB data that's good for "one day". One day is defined not at 24 hours, but as the day you order the service through the end of the next day - so this way you will get at least one full normal day of service and then some. This $5 plan is the only option you can add to your smartphone plans if you have a phone that can act as a mobile hotspot. For $25 you get 1.5 GB and for $55 you get 6 GB of data per month. Depending on the mobile hotspot device you order, the data can be shared with 5 or ten devices at a time. Devices available include the Netgear Mingle which allows ten devices to connect and the Overdrive Pro which allow five devices. There is a good choice of phones available. Many Android smart phones are priced at less than $100 and feature phones are available for under $30. Not bad when you consider that there is no long term contract. If you're in a good coverage area you should take a look at the selection. There are also a few basic phones like the Kyocera Kona and QWERTY phones like the Samsung Montage that are eligible for the PayLo plan. You can purchase their phones from retail stores like Walmart and Best Buy, or directly from Virgin online. Here are some more options from other plans you may want to consider. Straight Talk has a good lineup of smart phones, some of which run on the same network that Virgin uses, namely Sprint. What if you don't need a smart phone? The triple minutes feature now makes Tracfone's more suited for people who don't need unlimited voice or texting. They now offer smart phones but not . . . If you do need unlimited texting, you can seek out the major brands as well as plans from smaller plans such as Red Pocket and PTel. If you want entertainment options such as music you can consider the Cricket plans that offer free music and ringtones from popular artists.